Sanding is easily the most tedious woodworking operation. It can sometimes take as long to hand sand a project as it takes to build it. Fortunately, you have four sanding choices with the Shopsmith Woodworking System: disc sander, drum sander, strip sander and belt sander. In this tip, we will concern ourselves with the disc sander. A disc sander can help eliminate some of the sanding tedium. It can't be used to fine sand, but it will remove saw marks from a ripped edge and smooth end grains. It can also be used to bring a workpiece to its final dimension, true-up joints and grind tools. Figure 17-1. The acessories that are used for disc sanding operations are the: (A) sanding disc and sandpaper, (B) worktable, (C) miter gauge, (D) rip fence,and (E) extension table. The Model 510 is shown. 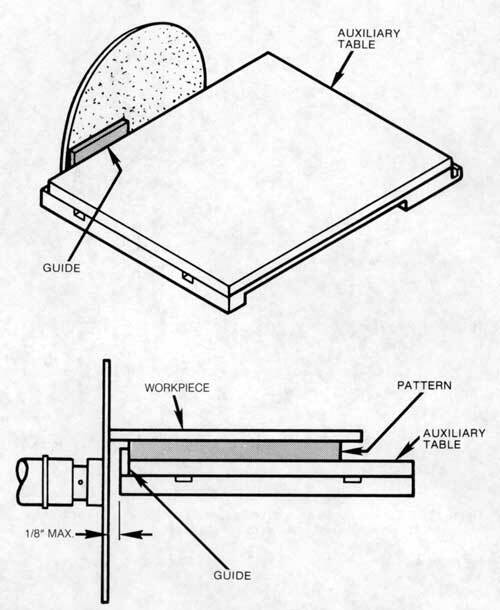 Use the accessories shown in Figure 17-1 for disc sanding operations. To set up your Mark V in the disc sander mode, follow the instructions in the Owners Manual that came with your machine. The 12" disc has a sanding surface of 113.04 sq. in. The rip fence functions as a backstop when sanding long or wide stock. Without a backstop, you can sand as big a workpiece as you can safely handle. 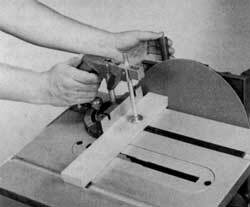 The miter gauge can be used to hold stock at the proper angle to the disc. The table tilts from "0" to 45� right and the miter gauge can be adjusted from 30� left to 30� right to sand at a variety of angles. The rip fence can be offset to sand boards to a specific width. 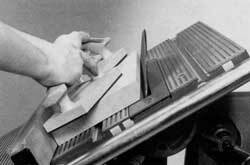 The quill feed and feed stop can be used to sand boards precisely to a specific dimension. You can sand without the rip fence or a miter gauge. This is particularly useful when sanding convex curves. Figure 17-2. Mount a seond disc on the upper auxiliary spindle and you'll have two different abrasives available. The extension table supports the stock. A very practical setup is shown in Figure 17-2. By mounting a second disc on the upper auxiliary spindle, you can have two different abrasive grits available at the same time. 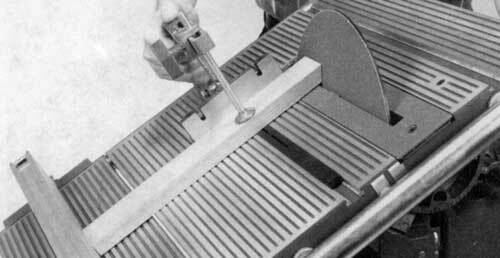 The Model 510 lower saw guard accommodates the sanding disc. Connect the hose from your dust collection system to the dust chute in the guard for virtually dust-free sanding. For dust collection on the Model 500, a special disc sander dust chute is available. The sandpaper discs are available in three garnet grits: coarse, medium, and fine. All three grits are open coat-only 40 to 60 percent of the disc surface is cov-ered with abrasive material. This helps minimize loading at high speeds and extends the life of the disc. Coarse grit will remove large amounts of stock quickly. It can be used to bring workpieces to their approximate dimensions; however, it leaves a rough surface. If you want a smooth finish, you must follow up a coarse grit with a medium or fine grit before hand sanding. Medium grit will remove small amounts of stock and can be used to bring workpieces to their final dimensions. It leaves a fairly smooth surface. From a medium grit, you can go straight to hand sanding. Fine grit leaves a smooth surface. It greatly reduces the time you need to spend hand sanding, though some hand sanding will still be required to remove swirl marks and obtain a perfectly smooth finish.Fine grit can also be used to grind and sharpen tools. Caution: When using the sanding disc on the Model 500 that's not equipped with the special disc sander dust chute, place a wide scrap board on the way tubes directly under the disc. Sandpaper continually loses grit, and the board will keep this grit off the way tubes where it could scratch them. If you don't use a board to protect the tubes, be sure to clean the tubes thoroughly after you finish your sanding operations. Danger Zone-The danger zone on the Mark V when it is in the disc sander mode extends 3" on all sides of the disc, plus 3' in front and back of the disc. The reason for the extended danger zone in the front and back of the machine is the possibility of kickback. Always keep your fingers, hands, and other parts of your body out of the danger zone. Once inside the danger zone, the slight-est mistake can result in an injury. Turn on the Mark V, let the disc get up to speed, then feed the workpiece. Don't turn on the power with the stock laying on the worktable or already in contact with the disc. Figure 17-3 . Always work on the downward motion side of the disc. Click on image for larger view. Always sand on the downward motion side of the disc (Figure 17-3). The rotation helps to hold the workpiece against the table. 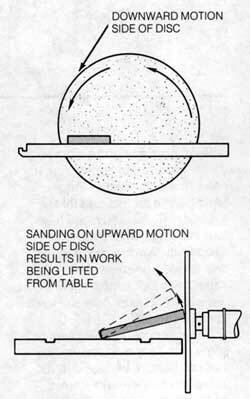 If you sand on the upward motion side, the disc will lift the piece off the table and cause a kickback. When using the quill feed to advance the disc, back up the stock with the rip fence. If the stock is too long to backstop, clamp the stock to the worktable or extension table. Before you begin any disc sanding operation, set the Mark V to run at the correct speed. To do this: turn the machine on, turn the speed dial to the correct speed and let the disc come up to speed. The operating speeds for disc sanding are determined by the grit you're using and the material you're sanding. Generally, you can use faster speeds on softer woods. Faster speeds will also give you a smoother finish. Slower speeds reduce the risk of burning the workpiece and are better for sanding away large amounts of stock. To help determine the right speed for the job, use Table 17-1. A good rule of thumb is: The softer the material or the finer the grit, the faster you can run the sander. However, don't run the sanding disc too fast or the wood may heat up and burn. Note: These speeds are for 60 hz operations. End grain is harder to sand than any other surface, but the Mark V in the disc sander mode makes short work of this chore. You can also use the disc sander to sand workpieces to precisely the same length. To sand end grain, position the worktable no farther than 1/16" away from the disc (if you're not using the quill feed) or 1/2" (if you are using the quill feed). Adjust the table height so that the under-side of the table just clears the dust chute and the table is slightly above the center of the disc. When selecting the speed, keep in mind that you want to run the sanding disc a little slower than you would for other types of sanding because end grain will burn easily. Use the miter gauge to align the workpiece with the disc. 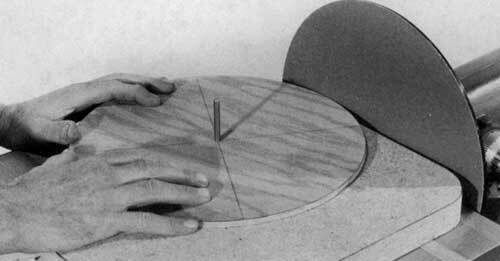 Check that the miter gauge is square to the disc, and mount it in the left table slot, closest to the disc. Position the gauge so it will guide the workpiece against the down-ward motion side of the disc; then lock the miter gauge in the slot. Make a five-point check. If you plan to feed the stock into the disc, all five locks--power plant, carriage, table height, table tilt and quill--should be secure. If you want to use the quill to feed the disc into the stock, the quill lock should be loose. Stand to the right or left of the sanding disc. Turn on the Mark V and let the disc get up to speed. If you're feeding the workpiece into the disc, place it against the face of the miter gauge and carefully feed it toward the disc until it lightly contacts the abrasive. Hold it there a few seconds, back it out, then feed it forward again. This back-and-forth motion will keep the end grain from heating up and burning. Repeat until the end grain is completely smooth. Figure 17-4 . When using the quill feed, move the disc in and out as shown. Don't let the stock contact the abrasive for more than a few seconds at a time. If you feed the disc into the workpiece, use the quill feed to advance the disc until it lightly contacts the workpiece (Figure 17-4). Let it stay there a few seconds, back it off, and feed it forward again. Once again, a back-and-forth motion helps prevent burning. Repeat until the end grain is smooth. As you work, don't press the workpiece and abrasive together too hard. Heavy pressure will cause the sandpaper to load up with sawdust and pitch. It will also increase the likelihood of burning. A light, momentary pressure is all that's needed. If you need to sand a number of boards to precisely the same length, use the rip fence mounted to the worktable or the extension table as a backstop. Position the backstop so that it will hold the end of the workpiece about 1/4" away from the sanding disc when the quill is completely retracted. Figure 17-5 . To sand boards to exact lengths, use the quill feed and set the feed sop to stop the disc where you want to finish sanding. Set the depth control to halt the disc where you want to stop sanding. To do this easily, use a board that you've already sanded or scrap wood that you've cut off at the desired length (Figure 17-5). Position the workpiece on the table, against the miter gauge and the rip fence, so that it overhangs the table slightly. Be sure the workpiece doesn't contact the sanding disc. Then make a five-point check. Four of the locks--power plant, carriage, table height, table tilt--should be secure. The quill lock should be loose. If the workpiece is long, use a miter gauge extension for more support. Stand to one side or the other of the sanding disc. Squeeze the safety grip with one hand and turn on the Mark V. Let the disc get up to running speed; then, with the other hand, feed the disc forward slowly with the quill until it just contacts the workpiece. Figure 17-6. Sand one end of the board until it's smooth; then turn the board as shown and sand the other end until the depth control stops the sanding disc. Advance the disc, back it off, then advance it again, lightly sanding the workpiece. Once again, light pressure is all that's needed. Don't extend the quill all the way at this time; just sand until the first end is smooth. When it is smooth, turn the board and sand the other end (Figure 17-6). This time, advance the disc until the depth control stops it. Repeat this procedure as needed with the other boards you have to sand. When finished, they will all be exactly the same length. To remove saw marks from the edge of a board after ripping it or to true it up so that it's exactly the same width from one end to the other, sand the edge. Figure 17-5 . Offsetting the rip fence for edge sanding. Mount a sanding disc and adjust the worktable height. Position the worktable so it is no farther than 1/16" away from the disc. Mount the rip fence on the table, but don't lock it yet. Adjust the right-hand setscrew in the base to offset the fence (Figure 17-7). When properly adjusted, the rip fence should be 1/16"-l/8" closer to the disc at the front of the table than at the back. Position the rip fence so that the edge of the stock just touches the downward side of the disc. Make fine adjustments with the quill feed. Figure 17-8. When edge sanding, feed the stock slowly form the back of the worktable to the front. Use a push stick and/or push blocks. Turn on the machine, set the speed dial and let the machine come up to speed. Feed the stock slowly from the back of the work-table toward the front (Figure 17-8). Repeat this procedure as Model 510 118" MAX. Figure 17-7. Offsetting the rip fence for edge sanding. needed until the board is the proper uniform width and all saw marks have been removed from the edge. Figure 17-9. This is the first step when sanding to an inside corner. Make the pass to the point where the disc's rim just misses touching the corner. Although a disc won't sand perfectly to the inside of a right angle cut, you can get close enough so only a slight touch-up by hand will be needed. Make the first pass by starting at one end of the work and moving from the edge of the disc toward its center. Hold the work flat on the table and pass it slowly across the disc (Figure 17-9). Smooth the second edge by following the same procedure or, if the edge is short enough, by mov-ing the work directly forward against the disc (Figure 17-10). Work so the disc's rim will just miss touching the inside edges of the cut. If you force the work, the rim will mar it. Figure 17-10. The second pass can be across the disc or directly into it, depending on the length of the work. The corner will require a bit of hand finishing. Figure 17-11. 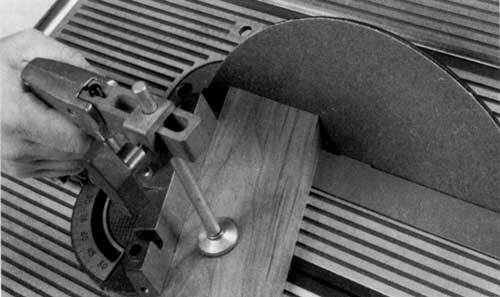 When sanding angles on the Model 500 use the quill to move the disc toward the stock. You can sand bevels and miters by tilting the table or adjusting the angle of the miter gauge, just as you do when sawing bevels and miters. Use the quill feed to move the disc toward the stock on the Model 500 (Figure 17-11). 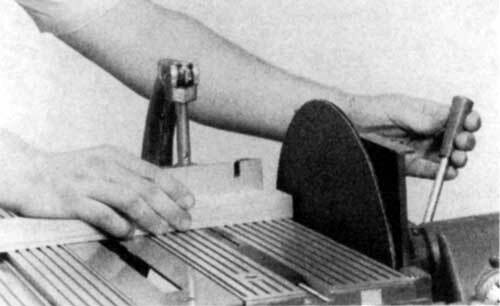 When sanding angles on the Model 510, position the disc through the table saw insert (Figure 17-12). Figure 17-12. 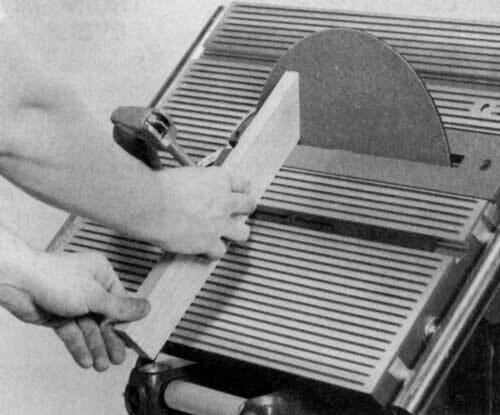 When sanding angles on the Model 510, position the sanding disc through the table saw insert. Because it's difficult to accurately measure and cut mitered or beveled boards to precisely the same length, it's best to saw them slightly oversize; then sand them to the desired length. Sanded miter and bevel joints fit better. Figure 17-13. 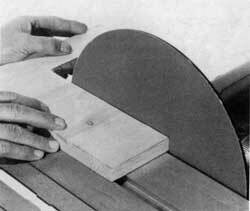 To sand a miter or bevel, use the same setup you used to saw it: (A) miter gauge angled or (B) worktable tilted. 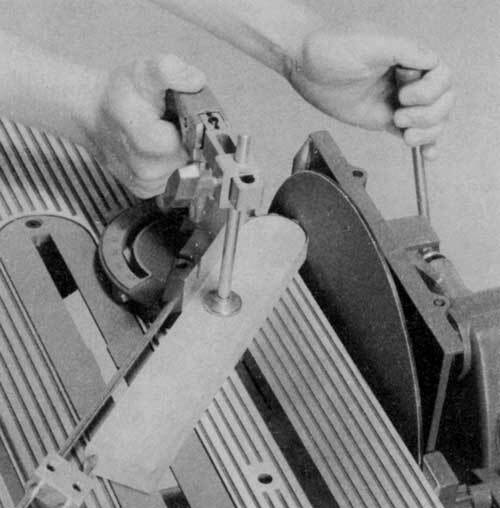 On the Model 510 the disc is mounted through the insert. To smooth an angled cut, don't change the tilt of the worktable or the angle of the miter gauge once you finish sawing. Instead, borrow the angles from the sawing setup. Raise the worktable and remove the saw blade and upper saw guard. 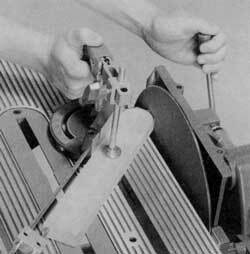 On the Model 500 remove the lower saw guard also. 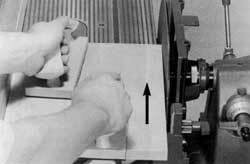 On the Model 510, exchange the table saw insert for the disc sander insert. 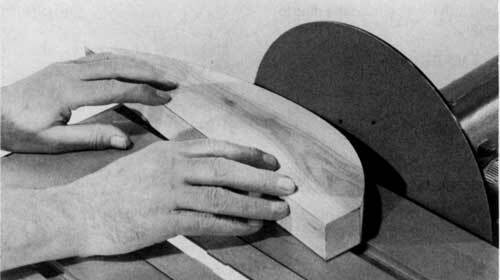 Mount a sanding disc; then readjust the table height and position the worktable for sanding. Clamp the workpiece in the miter gauge (Figure 17-13), and sand it at the same angle you cut it. The rip fence can also be used to back up the workpiece (Figure 17-14). Figure 17-14. The rip fence can also be used to back up the workpiece. Figure 17-15. When sanding compund miters, keep the miter gauge and the worktable tilt at the same angles used when making the saw cut. The procedure does not change if you are sanding a compound angle cut. Just keep the miter gauge and the worktable tilt at the same angles used to make the original saw cut (Figure 17-15). 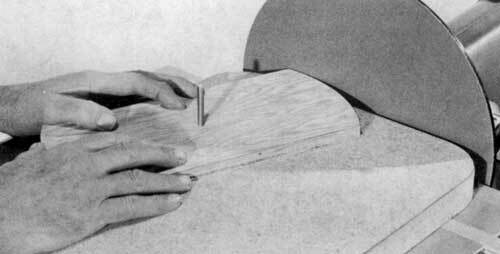 Use the sanding-to-width technique when you need to sand a beveled edge (Figure 17-16). Remember that the fence is offset enough to provide clearance for the workpiece in the area indicated by the small arrow in the photograph. Figure 17-16. Boards can be sanded to width using this setup. In this case the worktable is tilted to sand a bevel. The large arrow indicates feed direction; the small one indicates the gap needed between the workpiece and the "rear" half of the disc. When sanding bevels and miters, and especially if the angle is extreme, position the worktable and power plant at the right end of the machine. 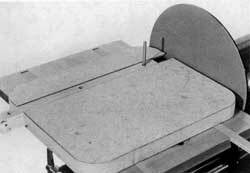 Length-of-work capacity will then be from the disc to the floor. Figure 17-17. To sand a chamfer in the edge of a board, tilt the worktable and proceed as you would when edge sanding. Don't take off too much stock in one pass. By tilting the worktable, you can also sand a chamfer on the edge of a board. Tilt the worktable to the right. Offset the rip fence as you would for edge sanding and position the rip fence so that the edge of the board to be sanded will contact the downward motion side of the disc. Make fine adjustments with the quill feed. 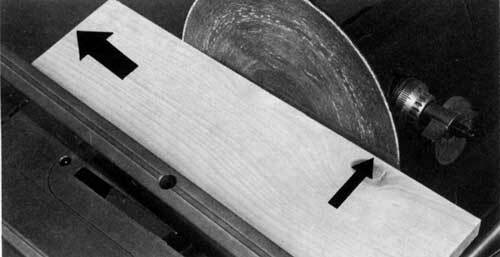 Make a five-point check--all locks should be secure--then proceed as you would when edge sanding (Figure 17-17). Be careful not to take off too much stock in one pass. Figure 17-18. (A) Perfect end chamfers are sanded by using a setup as shown and feeding the disc into the workpiece. 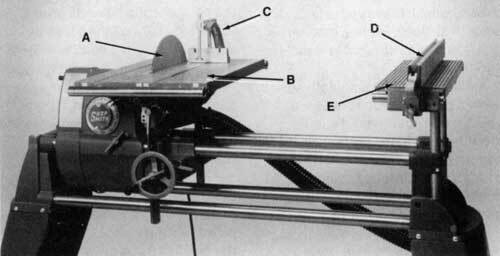 (B) End chamfering can also be done (Model 500 only) by tilting the worktable and using the miter gauge stop rod and the miter gauge with safety grip. End Chamfers-By using the miter gauge and a miter gauge stop rod, or by setting up the miter gauge and the rip fence, you can end chamfer any number of pieces so they will be exactly alike. The workpieces shown (Figure 17-18) are small, but there is no reason why the techniques can't be used on larger projects such as fence pickets or corner posts for box constructions. Figure 17-19. Use a light, sweeping motion when smoothing outside curves. Don't hesitate at any point or the disc will sand a "flat". To sand curves, move the work-piece in to contact the disc and then use a sweeping motion to maintain the work-to-disc contact throughout the pass (Figure 17-19). Feed should be light and smooth even when a great deal of material must be removed. Several light passes are always better than a single heavy one. The disc has a fast cutting action, so excessive pressure can cause burn marks and will lead to premature clogging of the abrasive. Figure 17-20. Use a guide to sand curved workpieces to a uniform width. The edge that bears against the dowel must be smooth and true. You can guarantee that curved workpieces will be of uniform width throughout their length if you follow the procedure demonstrated in Figure 17-20. The guide is clamped in place so the distance from the dowel to the disc will equal the width of the workpiece. 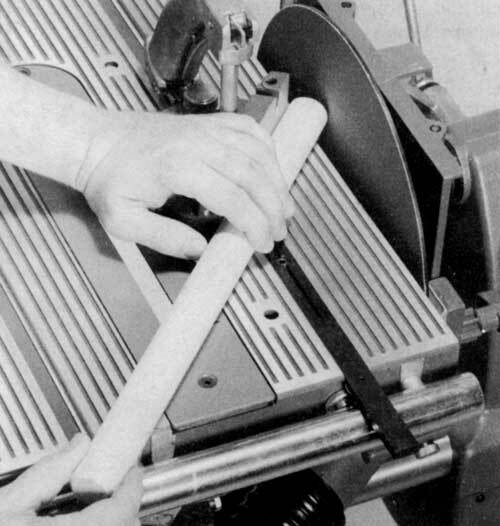 The stock is then slowly passed between the dowel and the disc. There are two important factors: (1) The curve of the workpiece where it bears against the dowel must always be tangent to the disc; and (2) the inside edge of the workpiece must be smooth and parallel to the outside edge, something you can accomplish with a drum sander. If there are bumps or hollows in the bearing edge of the workpiece, you will not get good results. The construction details of a guide you can make are shown in Figure 17-21. Figure 17-21. 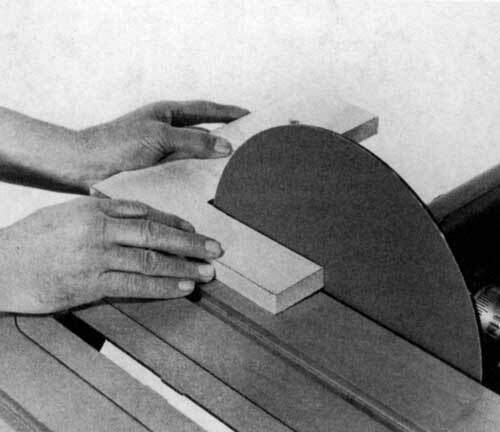 Construction details of a guide for sanding curved workpieces to a uniform width. Figure 17-22. A special pivot fixture that you can make to sand perfect circles. Circular workpieces can be sanded freehand. But you will be more accurate, especially if you need duplicates, by using the pivot method of guiding the workpiece. The miter gauge, locked in place and with a pin threaded in the hole that is at the end of the bar, can be used as the pivot. You can also make a special fixture, like the one shown in Figure 17-22. When setting up, place the workpiece on the fixture and posi-tion the worktable so the edge of the workpiece will be about 1/4" away from the disc. Advance the disc so it will start sanding the workpiece; then secure the disc's position by using the quill lock. The workpiece is then slowly rotated a full 360� (Figure 17-23). Figure 17-23. The workpiece is mounted on the pivot post and slowly rotated agains the disc. Use the same procedure, but with the worktable tilted to the right, when you need to bevel the edge of a circular workpiece. Figure 17-24. The pivot guide method can also be used to round off the ends of straight pieces. 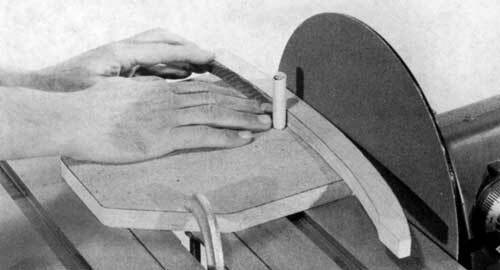 The same arrangement is useful when you need to round off the ends of straight pieces (Figure 17-24). Drill a pivot hole at the center of the workpiece; then proceed to sand as if the work-piece were fully circular. 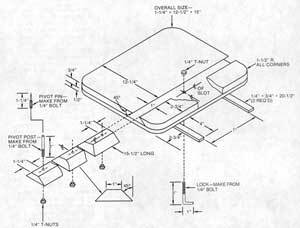 Construction details of the pivot fixture are shown in Figure 17-25. Notice that you can make pivots that are straight posts or are pointed. Figure 17-25. 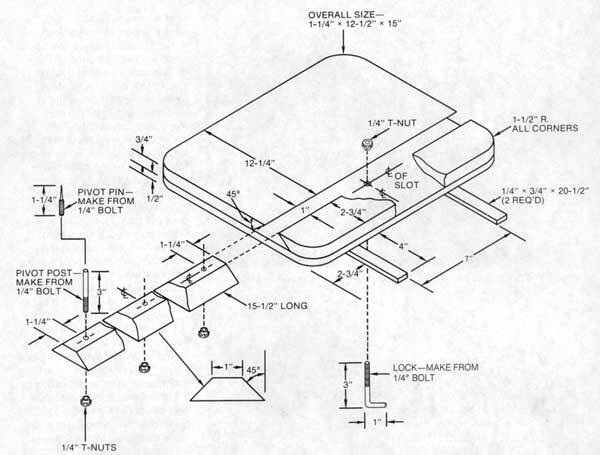 Construction details of the pivot fixture. Notice the two types of pivot posts; one has a point to be used when the workpiece does not have a center hole. The short, pointed one can be used when the workpiece does not have a center hole. The L-shaped lock can be used to secure the sliding bar if you remove the table insert before putting the fixture in place. The pivots, if threaded deeply enough, will also serve to secure the bar in a particular position. Figure 17-26. To pivot sand extra-large circular workpieces, mount the lathe cup center to: (A) the rip fence of the Model 500 or (B) a rip fence extension on the Model 510. Click on image for larger view. After the workpiece is in position, advance and lock the quill (the amount of extension will be controlled by the depth control); then slowly rotate the workpiece until its entire circumference is sanded. Remember that the cup center point is just a pivot guide; the workpiece must rest solidly on the worktable. Figure 17-27. Corners can be rounded off by sanding to a line. The bulk of the wast should be removed with saw cuts before you begin. One method of sanding round corners is shown in Figure 17-27. Prepare the stock by sawing off the bulk of the waste material and then finish the shaping by using the disc sander. When the radius of the corner isn't very large, the entire job can be done by sanding, a procedure that is especially applicable when you need many similar pieces. 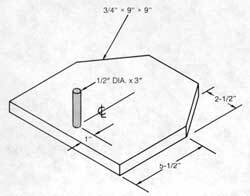 Set the miter gauge at 45� and use the miter gauge stop rod as a backup for the workpiece. Secure the workpiece by holding the safety grip and, with the depth control set to limit the disc's extension, feed the disc forward to sand to a line that is tangent to the curve (Figure 17-28). Figure 17-28. This is a setup that can be used if the corners are not too large. First sand to a line that is tangent to the curve. Finish rounding off by working freehand. After all corners have been sanded in this manner, finish the job freehand. There will be very little material left to remove. Figure 17-29. 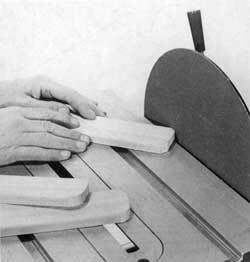 The ends of dowls or larger rounds can be pointed or chamfered freehand by angling the miter gauge. 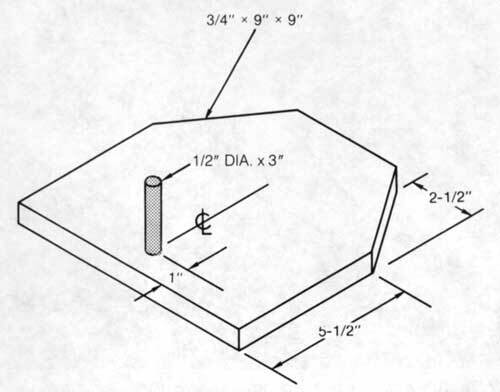 Pointing or chamfering dowels or rounds can be done freehand by setting the miter gauge to the angle you need and then using it as a guide as you rotate the workpiece against the disc (Figure 17-29). If you want more precise results or need to shape duplicate pieces, work as follows. Use the miter gauge stop rod or a long extension with a stop block to back up the workpiece. Advance the disc to the point where it will form the chamfer or point you need while rotating the stock against the miter gauge. Figure 17-30. The pattern sanding procedure shown here is useful when many identical pieces are needed. Pattern disc sanding is useful for sanding duplicate pieces, especially if they have an odd shape. The procedure is shown in Figure 17-30. The guide, preferably metal, is attached to the edge of an auxiliary platform which is clamped to the worktable so the guide will be about 1/8" from the disc. 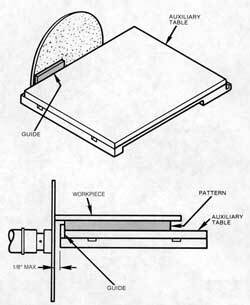 The workpiece, attached to the pattern, projects over the guide to contact the disc. Therefore, the distance from the guide to the disc and the thickness of the guide must be considered when shaping the pattern. The pattern must be smaller than the actual workpiece. 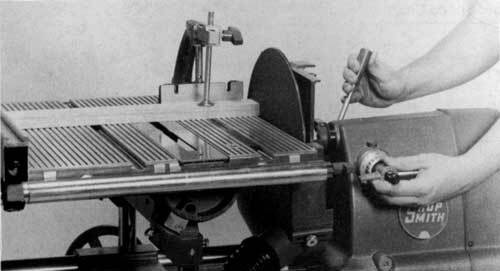 The workpiece is attached to the pattern by tack-nailing or using nail points projecting from the pattern. When you rough-cut the workpieces, try to leave the least amount of material for the disc sander to remove.